Looking for a nice Lottery Checker Spreadsheet?? Download this Lottery Checker Spreadsheet template now!! Lottery ticket checking can become a tedious chore, but if you don’t play you won’t win. Now there is an easier way to check those numbers to see if you won the million dollars. Simply use the Lottery Checker Spreadsheet to make your life simpler. This template offers users a faster way to finding winning tickets. If you can type and are computer savvy, this will be the best find yet. The Lottery Checker Spreadsheet is good for any lottery up to six numbers. As long as you provide the same amount of numbers your ticket lists and you enter the winning numbers with the same amount, the calculations will come out correctly. On the left hand side, you will enter your five numbers plus your special number if you have one. If you are playing the pick three or four or five lottery, you can enter these in the spaces as well. In the top middle space you will enter the winning numbers, and make sure you don’t mistype. 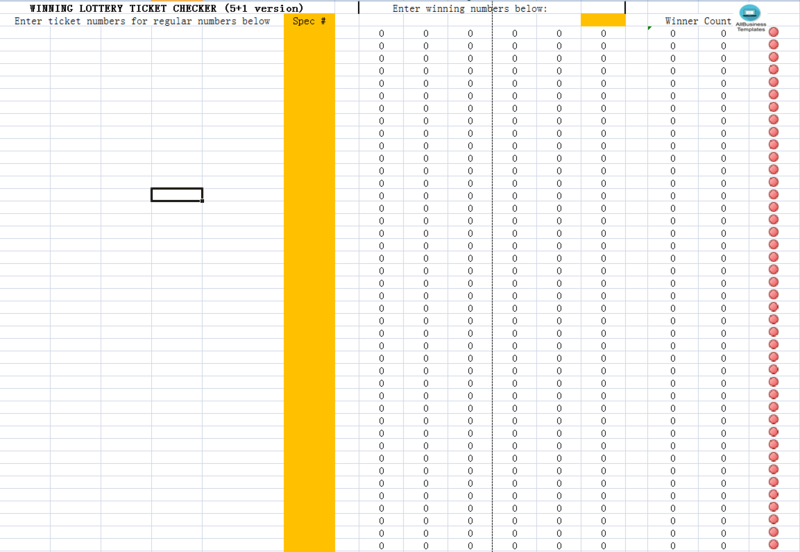 The Lottery Checker Spreadsheet will then recognize whether or not your numbers match the winning numbers you typed and populate on the right hand side how many you matched or did not match and whether you matched the special number. When you enter your numbers, make sure you are keying in the correct digits. You may become frustrated if you believe you had more winning numbers than calculated because you keyed in an incorrect digit. If you want to monitor your numbers whether they hit a lot or hardly ever, this tracking spreadsheet will assist you in picking your next numbers. You can also see whether a number comes up more often than any other number. If you are a lottery enthusiast, this spreadsheet can be a great way to calculate odds, keep particularly close to the special number, as this is usually the number that wins you the huge jackpot. Playing the lottery has never been easier. Downloading the Lottery Checker Spreadsheet is as easy as buying the lottery ticket.